We’re all excited to cheer for our three Olympic athletes from Telluride. 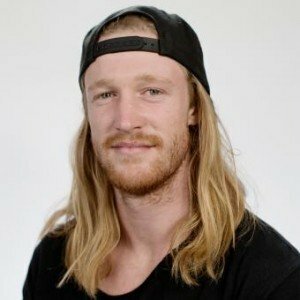 If you’re not in South Korea, here’s a quick guide to the NBC TV coverage of Keaton McCargo, Hagen Kearney, and Gus Kenworthy. Keaton McCargo is up first. She nailed her first qualifying run last night. The second qualifying round is at 5:30 a.m. EST (3:30 a.m. MST) on Sunday, Feb. 11, followed by the finals at 7 a.m. EST (5 a.m. MST). McCargo was born and raised in Telluride and attended Telluride Mountain School. She has been a moguls skier on the U.S. Ski Team since 2013 and has earned several top 10 finishes in World Cup events as well as a national title, and finished last season ranked sixth in the world. She also had a podium finish (third) in a World Cup this season in Finland. McCargo is a hard-working athlete and enjoys painting in her spare time. Fun fact: McCargo will also be coached by a Telluride athlete, Caleb Martin. Martin was a moguls phenom in 1998/1999, finishing sixth in the world in Japan and named FIS World Cup Rookie of the Year. Martin was sidelined with knee injuries and went on to coach the Telluride Freestyle Team for about a decade before he was recruited to coach the U.S. Freestyle Team, mentoring McCargo on both teams. Hagen Kearney is next to ride. He races at 9 p.m. EST (7 p.m. MST) on Thursday, Feb. 15 in the seeding round and later that evening in the finals at 11 p.m. EST (9 p.m. MST). A prolific snowboarder from Norwood whose home mountain is Telluride, Kearney competes in Snowboard Cross (SBX). He started racing on the World Cup circuit in 2012 and has many top ten finishes, and he is a three-time X Games competitor. Kearney had his first World Cup win in 2016 and also won the Nor-Am Cup in February. He attended Telluride Mountain School and was also involved with the local Telluride Ski and Snowboard Club. Kearney is also plays in a metal band, and loves motorcycle riding and skateboarding. Another fun fact: The SBX course that Kearney competes on (as well as the Slopestyle course) will be built by another Telluride local, Kevin Younger. 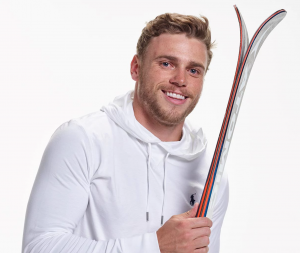 Last up is Telluride’s hometown hero, Gus Kenworthy. Kenworthy will compete in Slopestyle events at 7 p.m. EST (5 p.m. MST) on Saturday Feb. 17, at 8 p.m. EST (6 p.m. MST) on Sunday Feb. 18, and at the finals at 11 p.m. EST (9 p.m. MST) on Sunday Feb. 18. Kenworthy won a silver medal in Slopestyle at the last winter Olympic Games in Sochi, Russia and easily qualified to return to the Olympics in South Korea. Kenworthy was second in the World in 2017 in Slopestyle, and also 10th in the World Cup Standings in Halfpipe. (He narrowly missed a chance to also compete in Halfpipe in South Korea.) He also took silver in Slopestyle and Superpipe at the X Games in 2016 and has a long, long list of other credentials under his bibs. Kenworthy is probably the most recognizable U.S. freeskier in the world. Kenworthy became even more of a hero when he came out publicly as gay. He was the first openly gay athlete competing in his sport, and he was embraced and supported by his family, friends, fans, fellow athletes—and the LGTBQ community. He has been featured on magazine covers, commercials, and all types of media. If you haven’t seen the beautiful letter written by his mom Pip Kenworthy or the video tribute he made to his mom, you will definitely want to check them out—but make sure you have tissues. One last fun fact: Telluride timekeeper John Jett of CJ Sports Timing will be doing the timing for Alpine racers. Jett got his start on the race hill in Telluride and soon expanded his skills to the Imogene Pass Run and all types of elite sporting events. 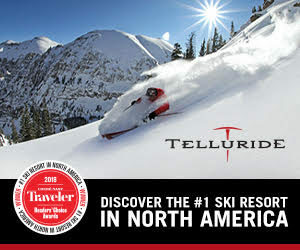 Good luck to all the athletes, coaches, timekeepers and course builders from Telluride. There are lots of opportunities to watch them compete, so don’t miss it. 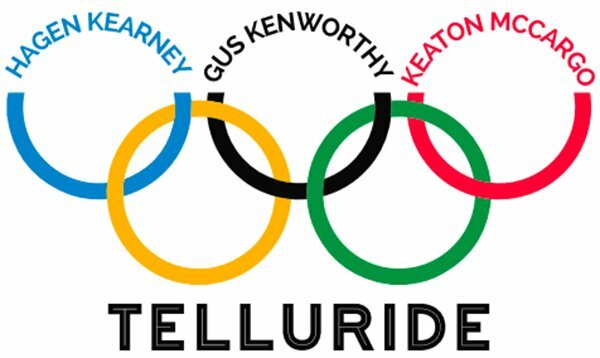 *Thanks to Telluride Ski & Snowboard Club and graphic designer Tor Anderson for sharing the Olympic athletes logo.